eFoodHandlers' mission is to promote food safety through education. Schools and educators who teach food safety to students are partners in this important effort. Each year, eFoodHandlers provides free training to thousands of School Students, Volunteers, and economically challenged food handlers and workers. eFoodHandlers is also a strong advocate for those contributing their time and energy for the benefit of others. We support volunteer efforts by offering discounted services wherever possible. Please email us at BusinessServices@efoodhandlers.com to find out how we can support your efforts. We look forward to partnering with you! eFoodhandlers will work cooperatively with governmental agencies to provide vital safety training to food handlers and workers. This includes website creation, training partnerships, and even pay-for-click advertising. Contact for more information. For more information on any of our assistance programs, please contact Customer Service. 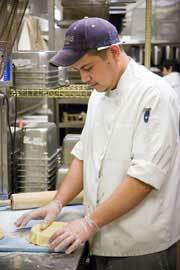 "Thank you for allowing my students to take the food handler card test at no charge. All of the students in my classes were able to get their food handler card in May. I wish you could have seen their sense of achievement!.." "This has been a great experience for us and I really feel like the students have learned a great deal!" "You guys are the best! We pride ourselves on our customer service because you just don't see too much of it anymore. It is refreshing to see that we're not alone.."
"I would like to thank your organization for helping my 8th Grade Foods students receive their Food Handler's Permits. You were exceedingly helpful in working with me as I tried to navigate the web to maintain my students privacy. My students are very proud of themselves as they have made this first step into the working world."